Getting your furry feline to enjoy a walk with you is no easy task. However, with patience and love your cat will be walking on a leash in no time! 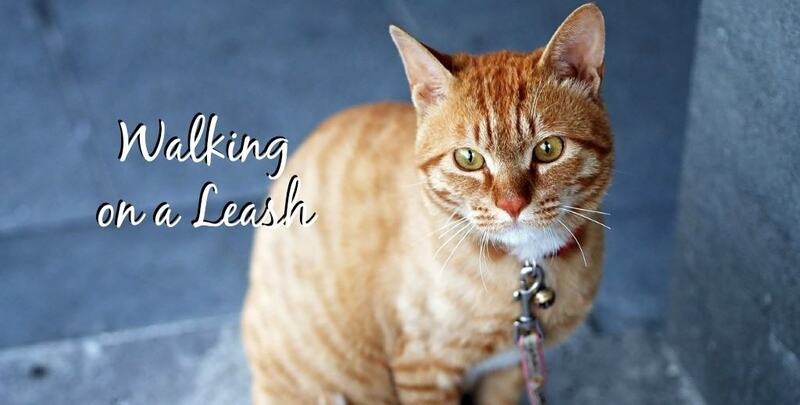 Learn how to walk your cat on a leash with these 7 easy and simple steps. While you begin this process, remember to reward and praise your kitty – it will go a long way! 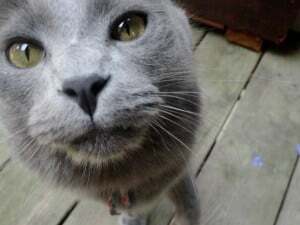 Be mindful of your cat’s personality: are they adventurous or timid? Do they shy easily or are they curious? Not all cats will adapt easily to wearing a harness or walking on a leash. This is why we recommend training your cat to wear a harness and walk on a leash from a young age. Kittens will be naturally more accepting of this new experience. However, with patience (and treats!) your adult cat can learn how to walk on a leash, too. Explore bigger parks and trails with your cat on a leash! 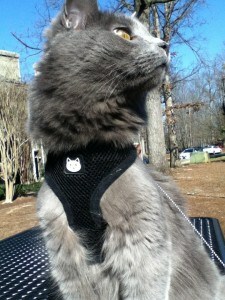 ⇒ First and foremost, invest in a comfortable harness especially fitted for cats or kittens. The first harness we bought for Yoda was slightly too big, but it worked out perfectly. Why? Your kitten will grow rapidly over the course of a few weeks, so investing in a slightly larger harness will allow them to grow into it as they get older. Buying a harness that is a little bigger will also allow them to not feel too tight while they practice getting used to the feel of the harness for the first few weeks. ♥ Tip: When shopping for a harness, I recommend buying one that adjusts around both the neck and body/waist and one that has a thick, mesh material that covers the cat more evenly, rather than a harness that has thin straps. For example, in the picture above, Yoda is wearing the first harness that he grew into. It had no buckle around the neck so it easily slipped over his head and it passed under both his arms and buckled at the back for easy securing and removal. This allowed his neck, shoulders, and legs to be safely and comfortably secured – If ever he tugged, the pull would be distributed evenly on his body and would not strain any particular part or have any thin straps digging into his skin. ⇒ Next, once you have the right equipment, introduce the harness and leash gently to your cat. Leave it next to their food, cat stand, or somewhere that makes them happy so they can begin associating it with contentment. Give your cat a treat (or two) when they sniff the harness so they know the harness means a good thing! ⇒ If your cat is used to being held, great! If not, practice for a few days by holding him/her on your lap as if you were going to put on the harness. Reward him/her for good behavior by offering a treat immediately afterward. ♥ Tip: I always had the treat ready in hand, that way Yoda feels good just sitting on my lap while holding the harness too. 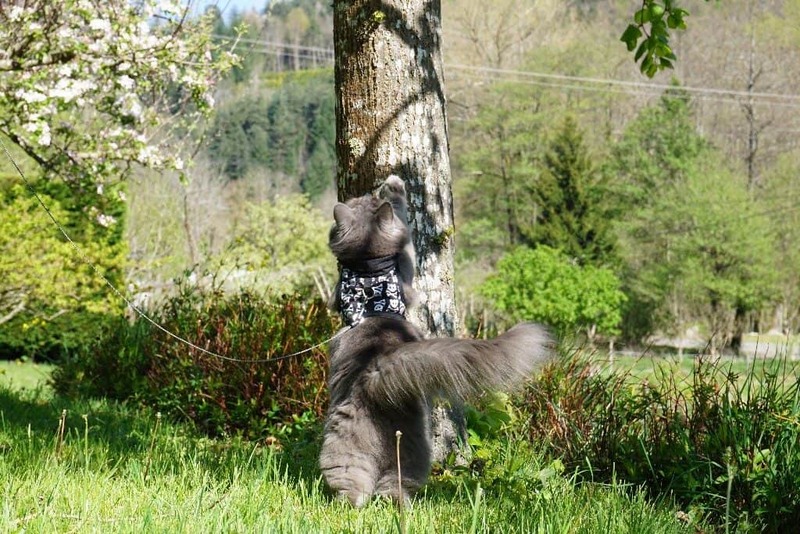 Associating praise and treats with the harness will help your cat get used to the leash faster. Repeat this exercise until your cat is comfortable with the harness and is able to walk around comfortably (in the house) for an extended period of time. ⇒ It’s natural for your cat to resist the harness once you successfully buckle it on. It will feel alien to them and so they will most likely lay down and try to take it off. Distract your cat from doing this at all costs. Offer them treats, throw a jingly ball, or dangle a string in front of them. This will help your cat get used to the fact that he/she is wearing something. Leave your cat to walk around on its own with the harness still on. Keep a close eye though, if they try to take it off repeat your distracting tactics. After 15 minutes of wear (more or less, depends on your kitty), gently take your cat into your lap and offer him/her a treat and don’t forget to praise and caress! Then gently unbuckle the harness and remove it slowly. Once successfully removed offer another treat and praise again. The next big step is to have your cat wear the harness and leash inside your home for longer periods of time without even noticing it. Once they can do that – that’s a great sign! At first, your cat might try to play with the harness or leash. This is tricky because if they see the leash, they will try and play with it and attack it. Offer distractions to take their mind off wearing the harness or playing with the leash. What if my cat keeps playing with the leash? Let your cat chase a long string that you are circling around yourself to distract from the leash. Once your kitty has learned the leash isn’t a toy, practice tugging gently and stopping the leash while walking between the rooms of your home. Yoda exploring on his harness and leash 🙂 Great for simple strolls around the backyard! 5. Getting out the front door: Start with very small trips! If your cat comfortably wears their cat harness and leash inside the home, then you can begin training to go outdoors. Cats who are already skittish of going outside will need more time to adjust. The world’s a big, curious place! If your cat has never been outside before, they’ll take their time, look around and sniff about. Our best advice for training your cat to walk on a leash is to not imagine what it’s like to walk a dog. Walking a cat is completely different! Focus on your cat’s pace and rhythm, steer them away from trouble, and always proceed gently! 7. Explore bigger parks and trails with your cat on a leash! 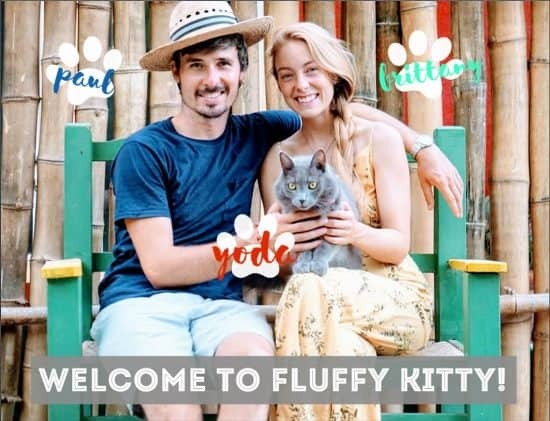 ⇒ Finally, introduce your kitty to public parks and trails! Pick a quiet grassy area with interesting shrubs, flowers, or small trees around. Doing this will entice your kitty to explore, which makes walking your cat on a leash so much simpler! In the first stages, never let your kitty wander too far from you. A loud car or barking dog could frighten them easily and they may bolt. ⇒ Depending on how your cat responds to the leash and the outdoors, continue extending the amount of time outside, eventually reducing the number of treats to only one or two (for start and finish). If your cat feels safe and comfortable enough to walk a little here and there on their own, purrfect! You did a great job training your cat to walk on a leash. Don’t let your expectations soar too high though, they are not dogs and will not easily follow your command. Take your kitty out on nice days so he/she can enjoy the fresh air. They will thank you for it! Always keep your eyes on your cat’s movements Never leave your cat unattended even for 2 seconds – your cat can bolt in less than 1! Read our experience training Yoda when he was just a few months old! We began training Yoda to wear a harness and walk on a leash from a very young age (about 10-11 weeks). At first, he wanted to play with it, get it off at all costs, but then we introduced treats and distracted him. We often took him outside (without a leash) and would just let him sit in our laps with the harness on. This was a great way for him to get used to wearing the harness because he was distracted by looking at the birds flying by, our dogs on the porch, or anything else. It was also just a great way to get him used to the outdoors. Little by little Yoda was becoming more and more comfortable with his harness. We decided to take him outside one day at my mom’s house, but I did not have a retractable leash – I just improvised and use my mom’s dog leash that had one length of a few feet. My first mistake! A gust of wind came and blew around all the leaves and in less than a second Yoda was free from my hold – he bolted and it snatched the leash right out of my hand! He began running around, free, and went into the woods and jumped on the trunk of a tree. I was able to grab hold of his leash and take him into my arms. I was so scared! It was not his fault, however. So I let him calm down in my lap, still outside, and then offered him a treat. Lesson Learned – always be alert! When Yoda was still young (about 13 weeks) Paul and I packed up and left for Greensboro, NC since I was about to start my senior year at UNCG. We went and bought a Flexi retractable leash and decided one day to take Yoda to the park. I carried him in my arms across the field to our spot under a shady tree. I walked Yoda around a bit, treat bag in hand, everything seemed fine! Next big mistake! I sat down, thinking Yoda would just walk around us, no problem. Instead, he ventured far enough below me to where the retractable leash ran out of cord (so, it was as if I had put on the brakes). Yoda felt this tug, and he was facing me so as it tugged as there was no more cord, he pulled backward while the cord was pulling him towards me. And in two seconds, he slipped free from his harness and went off sprinting towards the trees about 50 feet below where we were. Paul starts running after him (barefoot!) and I grab the treat bag and run after them. Yoda was happily adventuring freely in the bushes amidst the tall trees. He was excited – and we were scared silly. Brilliantly I shook the treat bag, calmly calling his name, Yoda. He knew that familiar sound of yummy treats so he came to me! The second he was close, I pounced on him! Lesson Learned – Never allow your kitty to pull in the opposite direction, and never let your kitty venture far enough away from you to where the leash locks. Send us your questions and comments! 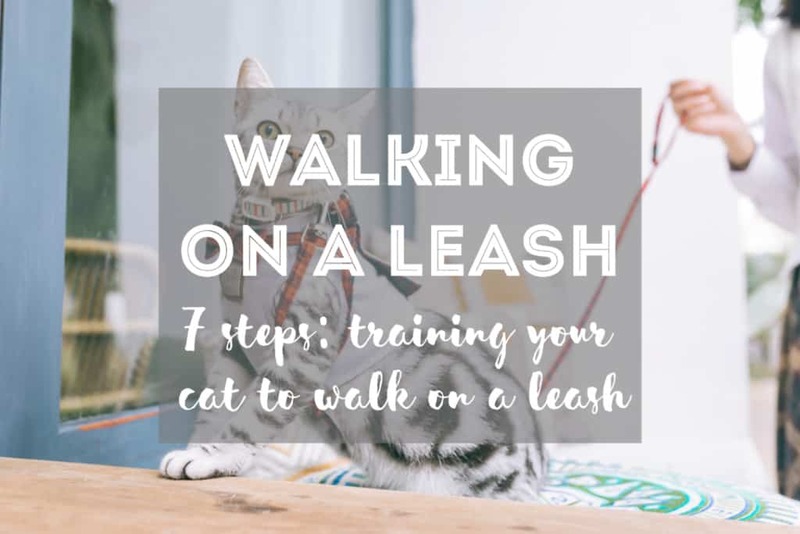 If you have any questions about how to train a cat to walk on a leash, please feel free to ask us! 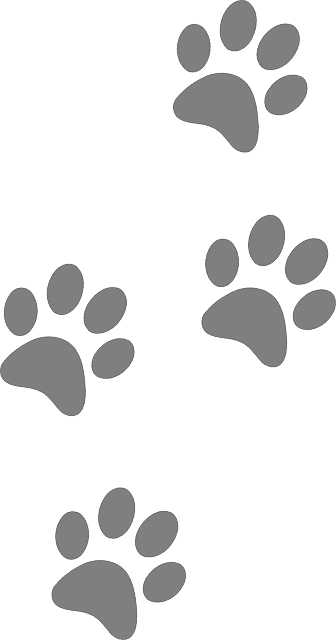 We would be very happy to offer more detailed advice that is tailored to your cat’s personality. Also, if you capture a great photo of your cat on a leash, please do send it to us! We would love to feature your cat’s accomplishments on our blog! There’s no secret sauce to training your cat to walk on a harness and leash! Over the years, we’ve found fellow cat explorers are training their cats to walk on a leash the same way we did with Yoda. With lots of patience, effort, and of course, treats! Just remember the 5 do’s and don’ts of walking a cat on a leash and you’ll be ready to hit the trails with your feline! Article originally published in June 2015 and last updated March 28, 2019. Hi Shasha! Thanks very much for reaching out. 🙂 We remember buying this harness at the very start of our time with Yoda – at a gigantic Wal-Mart in Weaverville, I believe. Smaller Wal Marts didn’t carry them, and I think we got lucky and found this one at the time. That was already 3 years ago so I imagine it’s possible they don’t make that kind anymore. Luckily for you though, for the same price that we paid you can now get SUPER great harnesses. We recently wrote a guide about some of the best harnesses available to date, you should check it out and see if you like any of those there. Otherwise, you can try to look online for similar “cat skull head” prints? We hope you find what you’re looking for! Thanks again. I am trying to find this specific harness Yoda is wearing in the picture in this post. I have not had any luck during my searches. Do you know the brand name or where you purchased it? Thank you. Hello Marisa! So sorry for the delay, we were out of the country travelling 🙂 We got this harness for 5-7 dollars at Walmart. There is only one size fits all so when we got it it was a bit too big at the time but Yoda grew into it. You can get the same kind of mesh harness for a good price on Amazon. Just make sure you check the reviews. Otherwise they are available at Petsmart but from what we’ve seen they are at least 3 times more expensive. Thanks again for your comment and hope to see you again on Fluffy Kitty! Why Is My Cat so Vicious ?